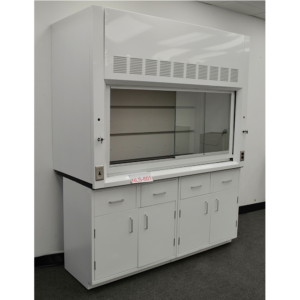 A fume hood is a ventilated enclosure used to contain gases, vapors, and fumes. It is one of the most effective devices used to protect laboratory professionals from air contaminants and hazardous chemicals. Understanding how a fume hood operates is imperative to ensuring a safe work environment and following recommended practices is a great place to start. Part of the protocol to ensure safety is through periodic inspections. But how often should a fume hood be inspected? The installation, operation, and maintenance of fume hoods are guided by a variety of governmental and industry organizations. And each organization publishes their own standards for proper use and inspection guidelines. Occupational Safety and Health Administration (OSHA) is the agency that provides regulation for fume hood operation. Their code addresses several aspects of laboratory design and operation. For fume hoods, they are primarily concerned with airflow at the face of the hood, monitoring, maintenance, and exhaust. OSHA indicates that the quality and quantity of ventilation should be inspected at installation, then regularly monitored at least every three months. A re-evaluation should take place whenever there is a change in the ventilation devices. American Society of Heating, Refrigerating and Air-Conditioning Engineers (ASHRAE) creates standards for testing and performance criteria for indoor environments. Specifically, ASHRAE Standard 110 outlines a test procedure for determining the operating capabilities of fume hoods. Their process addresses face velocity measurement, smoke visualization, and tracer gas containment. American National Standards Institute (ANSI) and American Society of Safety Engineers (ASSE) have published multiple standards for lab ventilation, hood monitoring, face velocities, and exhaust. Their standards state that a routine performance test should be conducted annually. Additionally, evaluation should take place whenever a significant change has been made to the operational characteristics of the system. Finally, the National Fire Protection Association (NFPA) has their standard on fire protection for laboratories using chemicals. This standard provides basic requirements to protect life and property through prevention and control of fires and explosions in laboratory operations. The NFPA says that a device should be inspected when installed or modified and then annually, thereafter. The organizations mentioned above have published their standards and recommendations, but it is suggested to perform visual inspections on a daily basis. Operators should check the fume hood for visible airflow blockage such as large items or containers near the slot opening. Other daily inspections include holding a tissue at the opening to observe inward airflow, maintaining clean surfaces inside the hood, and keeping the sash at an appropriate height when working and not working in the hood. As with all equipment, maintenance is important to proper operation. Whether you are performing inspections daily or less frequently, make sure your equipment is meeting minimum standards, if not exceeding them. The safety and well-being of the workers in your laboratory are dependent on the safe operation of equipment. If you find that your fume hood is faulty and you need it replaced, please contact us at (815) 670-6400.